Shared office 2004, a photo by PhylB on Flickr. Thomas has told me this is a very important anniversary. To be honest I couldn't have pinpointed it to the day, though I did know it was early March 2002. I had been with Collins exactly eleven years and a week, when someone brought round the new guy. I had been through the small talk with the new guy so often over eleven years, I probably didn't even look up. I ascertained he was a single, 30 year old Danish linguist who spoke twenty odd languages and who did computing too. I mentally categorized him as an Übernerd with whom I'd have little in common. I heard he'd be sitting at the opposite side of the office in a booth of his own, so figured I wouldn't see much of him. The weeks passed and we started to talk and we haven't stopped since! I found out to my surprise that we had more in common than I had expected. By a year later I found my Übernerd had become my best friend! When it became clear my marriage was on the rocks, my best friend became my partner and I haven't looked back since. I wake up every morning thanking my lucky stars that my feelings towards him were reciprocated. Occasionally, I try to imagine how my life would have turned out if Collins had left Thomas at the other side of the office. Obviously there would be no Anna or Amaia for starters. Given the strained relationship I had with my ex, which had worsened dramatically after Charlotte's birth and after he took on a high-powered job for a big US company just before the 911 stock crash, I know for sure I would be a single mum now, probably not very well off. I'd never have had the time or babysitters to chat up anyone new, so would have been leading a fairly lonely life with only my kids for company. 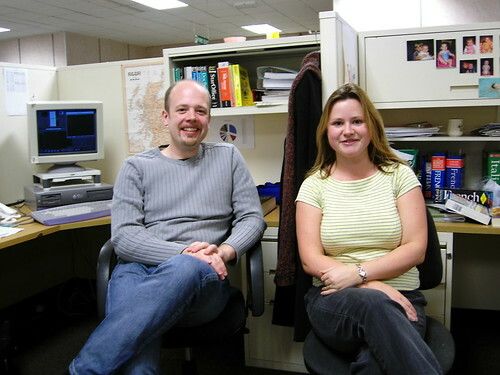 Ten years ago, some unknown member of Collins management decided to stick us two in an office together. I'm not a believer in fate, but if I ever find out who made that decision, I owe them my life, my love, my happiness and my kids! It's incredible how something seemingly insignificant can change your life forever!